Stem cell transplants can save lives, for example in patients with leukemia. However, these treatments are not free of risks. One complication that may occur is graft-versus-host disease (GVHD), basically donor-derived immune cells attacking the recipient’s body. A team at the Technical University of Munich (TUM) has identified molecular mechanisms that may protect patients against this dangerous response in the future. The key to preventing GVHD is in the gut. In order to enable foreign stem cells to multiply in the body and produce healthy blood cells, doctors first need to make room for them. This is achieved by destroying existing cells in the bone marrow using drugs or radiation. One of the risks resulting from this pre-treatment is GVHD, which occurs in about half of all treatments. In simple terms, during GVHD the transplanted stem cells become T lymphocytes. These immune cells, which are supposed to fight intruders such as bacteria, take a wrong turn and start attacking the recipient’s already weakened body. In a paper published in the journal Science Translational Medicine, an international team headed by TUM adjunct teaching professor Dr. Hendrik Poeck and Dr. Tobias Haas, heads of a research group at the third medical clinic of TUM's Klinikum rechts der Isar, and Professor Marcel van den Brink at the Memorial Sloan Kettering Cancer Center (MSKCC) in New York City, describes how this process could be prevented. The attacks by the T cells primarily affect the skin, liver and in particular the gastrointestinal tract. The intestine is believed to be the key organ where GVHD starts. The drug treatment and radiation cause damage to the epithelial cells, which form part of the intestinal mucosal layer. Stress signals emitted by the dying epithelial cells and the arrival of intestinal bacteria in the previously germ-free areas of the gut due to the loss of the epithelium trigger a sort of red alert that activates aggressive donor T cells. "If the epithelium could be protected or quickly restored, the risk of an immune response would be much lower," says Hendrik Poeck. "Up to now, however, there have been very few treatment strategies that seek to regenerate the epithelium." The scientists working with Dr. Poeck studied two proteins produced naturally in the body and known for their role in fighting bacteria and viruses: RIG-I and STING. "We were able to demonstrate for the first time that both of them can also be used to bring about a regenerative effect," says Julius Fischer, first author of the study. Both proteins are part of signal chains that cause type I interferon (IFN-I) to be produced. IFN-I triggers many different immune responses, but can also speed up the replacement of epithelial cells. It is well established that the RIG-I signal pathway can be deliberately stimulated using triphosphate-RNA (3pRNA). Poeck and his team were able to demonstrate in mice that 3pRNA can indeed protect the epithelial cells. The timing is decisive: Measurable protection was only seen when the 3pRNA was administered exactly one day before the start of radiation and drug treatment. 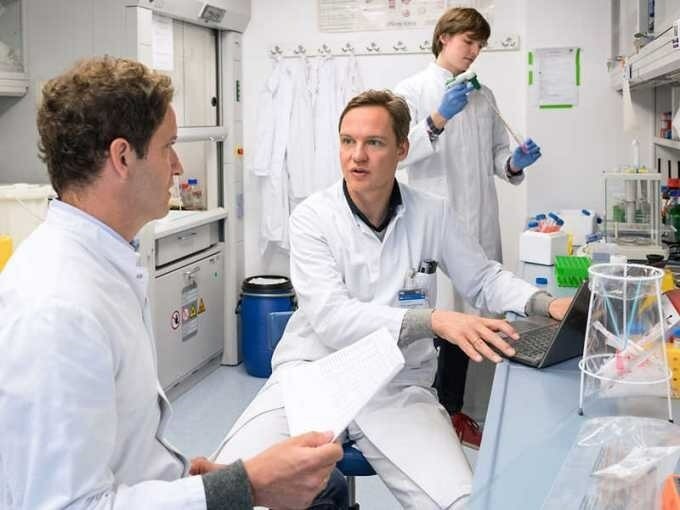 "We assume that after just one day of treatment, there would no longer be enough intact epithelial cells in the gut for the RIG-I/IFN signal path to function," explains Tobias Haas. Although fewer activated T cells were generated after a treatment with 3pRNA, the positive effect of the leukemia therapy was not reduced to a measurable degree. "Both RIG-I agonists, such as 3pRNA, and STING agonists are currently in clinical development," says Hendrik Poeck. The research points to a wide range of potential applications, especially in the treatment of tumors. "Our study shows that regenerative processes can also be triggered through selective activation of these signal paths," adds Poeck, explaining his team's results. "It thus appears quite possible that these selective agonists will be administered in the future to patients who are candidates for allogeneic stem cell transplants. However, further studies will be needed to learn how they actually work before applications in human medicine are possible."